The cost is $15 each for 6 ppl sharing three ergs for an hour - or three ppl can pay $30 each to get a full hour on a machine. These are coached sessions, and Andrea is a certified national level coach. I would highly recommend taking Andrea up on this - I really didn't expect this to be such a good tool for technique work. Hopefully everyone likes it as much as we do! The next step is to get some club clothing organized. Allan will be organizing this with consultation from one of the ladies. Stay tuned! The Gibsons Paddle Club hosted the 2018 Canadian Outrigger Champs on August 18 and 19. Our club sent a men's crew and a ladies crew. Rupert, Don and Carl stayed on Sunday to race the small boat event. Gibsons is an Idyllic setting for a weekend event like this. A quaint small town set in a picturesque West Coast setting, there is great food, nice shops, and lots explore. Although planning logistics for this event was a challenge, once we got there we quickly realized it was very worthwhile. The Gibsons crew put on a great event and the conditions and race course were perfect! We had some wind both days, so each event presented some really fun conditions. The start of the OC6 race was a hard push into the wind to a turn a few kilometers up the coast, then a long downwind run to the bottom of Keats Island, then back to Gibsons for a 20-22km loop. 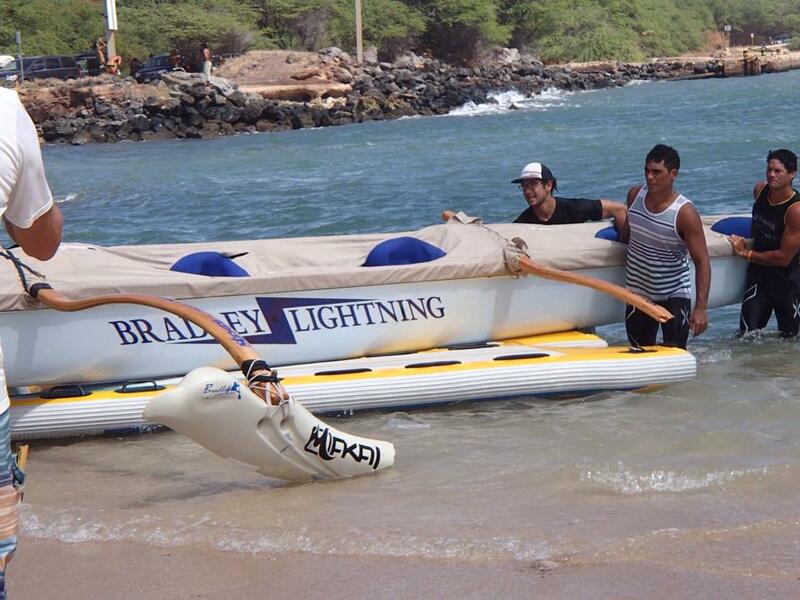 Our crews really enjoyed our new Malolo in these conditions. It was fast, fun and a joy to paddle. The wind dropped a bit by Sunday's small boat race, but gave enough of a bump for some fun runs and a course that presented some really varied conditions. The course was 10K, which gave us a shorter push into the wind, then a turn downwind, around a small island at the 5k mark, then back. Comox and Friends (Ladies): 2nd overall and 2nd open/unlimited category. Isn't she a beauty?? After years of drooling, talking, dreaming, scheming and planning, we finally have our first Unlimited OC6 and we couldn't be happier! 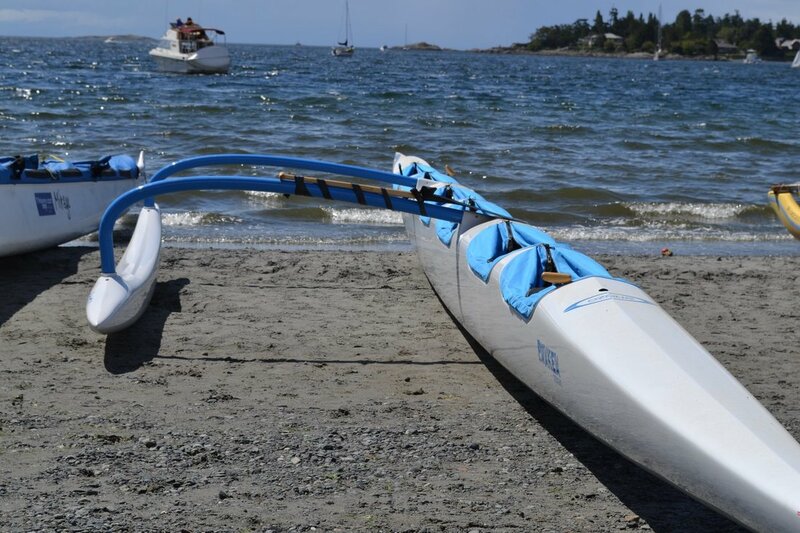 Thanks to Hana Hou Paddlesports (Don and Zoe), we brought home our club's new flagship, just in time for the Island Iron race in Victoria last weekend. Both the men's masters and women's open crews got to paddle the new boat and they couldn't stop grinning afterwards. As crews get more competitive, this super light boat will bring our club to a new level in paddling and enable us to compete with the best of the best, both locally and abroad. The two workhorse Mirage canoes in our compound will continue to be the go-to boats for practices and general training, but we have this secret weapon tucked away and ready for racing. Stay tuned, things are starting to get exciting at the Comox Valley Canoe Racing Club! Spring at the Comox Valley Canoe Racing Club! Looks like it has been a while since we have updated this site! Well despite our silence, there are a lot of very exciting happenings in our club. As the weather warms up, the club is in full swing with both OC6 and small boat training and racing. With a season full of race goals, you will see boats coming and going from the compound nearly every day of the week training for events in both the OC6 boats and various small boats. Our membership is growing fast with both competitive and recreational paddlers joining our ranks. It is great to see so many new faces at our regular practices and a full roster headed for this coming weekend's Island Iron race in Victoria. After a few races already in the bag this year, our ladies team is looking incredibly strong with some impressive finishes; and our men's team is showing some real potential with several eager new paddlers. Beyond racing, our club is hosting this year's Island Changes race at Sproat lake. Stay tuned for details about this exciting event on August 25, 2018. If this Spring is any indication of what is to come, stay tuned for an exciting season!! Another fantastic race in the books. 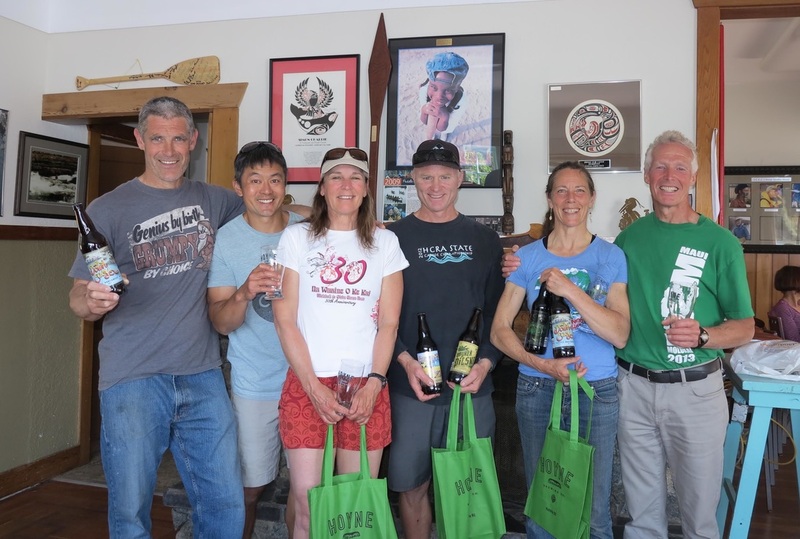 The Comox Valley fielded 5 teams in total counting mixed and only finished second to the young guns from Victoria (Fairway Gorge) in overall time but winning every division entered. We borrowed a trailer from Nanaimo and took our two Mirages down to the Hub City in order to compete with some of the best the Island has to offer. Some of our newest paddlers got a chance to race with some of our veterans giving them a really positive 1st outrigger racing experience. I wish that I had taken a photo of the huge smiles as the women's crews were coming back to the dock. The conditions had some surprises as the day wore on. In the mixed event it seemed that the wind was blowing directly in our face for all 8 directions. In the last 100 meters as we were coming into the finish line I remember thinking,,, we must be going the wrong way,,, the wind isn't in our face. Rigging today. Not allowed out of the harbour. Yesterday 2 boats had trouble due to high waves. Jim Foti did an end over with Lanikai & a Tahitian crew broke their Iano and split their ama in two. Forecast for race day favorable but challenging conditions.